I love being organized – it can save so much time if your are able to achieve it! Pinterest is a great source for organizing and DIY tips, and one day when I have too much time, I will test and implement everyone of those fantastic ideas! One idea I just recently came up with is to create a paint-touch-up-kit for my clients. I had been searching for the perfect containers for a while until I realized that small mason jars will do just fine. With the help of round Avery labels each jar was quickly and easily labelled. I kept the jars in the cardboard case they came in which made it is to carry the whole “kit”. Categories: DIY, Organization | Tags: mason jars, painting, touch-up | Permalink. 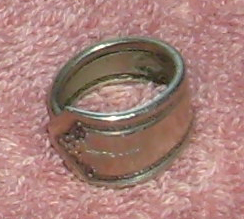 Spoon rings are easy to create and make great gifts. Clutter is a household beast that comes in all shapes and forms. Clutter can be a massive problem, taking up whole rooms in a house, or it can hide in smaller spaces such as junk drawers and miscellaneous cabinets. It can be a collection of everything you couldn’t find room for or it can be something specific such as clothes, books or even the odd assortment of items that clog up your medicine cabinet. No matter what form it takes, clutter can be tough to slay once it starts burrowing into your everyday life. Fortunately there are ways to tackle the clutter monster for good and even come out of it with some fun, creative and newly repurposed household items. In this article we’ll take a look at kitchen clutter, but the method can be used for any clutter situation in your house. It’s called the ‘Six Month Sort’ and all it requires is a little time at the beginning and the willpower to follow through with eliminating designated clutter at the end. Kitchen clutter is notorious for hiding. It may seem like we’re just very active cooks who have a lot of utensils ready to use when in fact, a lot of those items are used rarely, if at all. And most of those utensils usually aren’t displayed neatly in a countertop jar; they’re hidden in drawers or on top of cabinets or bunched up in the back of the pantry. There will come a time, if it hasn’t already, when you realize that you’ve had to dig through one too many wooden spoons to find a cheese grater in your utensil drawer and the time has come to clean house. The question is what do you throw out? Even if a utensil isn’t used every day, you might need it at some point, right? Step one: Start out by gathering all of your kitchen utensils in one place. Then go through the pile and set aside all of those utensils that you know you use regularly. The ones that you have never used or think you might use occasionally should go in another pile. Be honest with yourself! If you have five spatulas, chances are you could get by with two. Are there items that serve the same purpose, such as a can opener with a bottle opener feature and a plain bottle opener? Get rid of the bottle opener and see if you still need it in six months. Step two: Once you’ve sorted the regular use items from the rare-to-never used pile, place the never used items in a couple Tupperware bins and store them somewhere where they are out of the way but still easily accessible. This could be in a pantry, a kitchen cabinet or even an adjacent garage. Mark the day exactly six months from your sorting date on the calendar so that you have a goal date for the final part of the de-cluttering process. Step three: Use the next six months to determine what you actually need from that rare-to-never used pile. If you need an item, dig it out of the bin and add it to the general circulation. Do not go into the bin, however, if it’s just a matter of not having a clean spoon. If a simple dishwasher run will solve your utensil problems, wash a load or clean the items you need by hand. Over time you’ll have exactly what you need from your bin in regular circulation and everything that’s left can be tossed out or donated when you reach the last day of the six month de-cluttering trial. Instead of tossing out those kitchen items, consider giving them to a reputable local thrift store or better yet, see if you can get some creative repurposing out of them. There are many ways in which regular utensils can be reused. Colander lampshades cast beautiful star patterns on the walls and make for a great conversation piece. And they can be made with practically no effort. Just make one of the base holes in the colander a bit wider to accommodate the lamp shade toggle and you’re set to go. Colanders can also be used for lights hanging from the ceiling and they can be spray painted with an appliance epoxy spray to give them a bright new look. 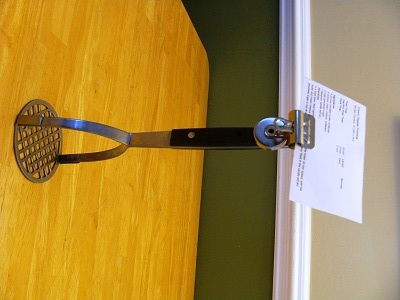 Potato mashers or any kitchen utensil that stands up on its own can be repurposed as a recipe holder. 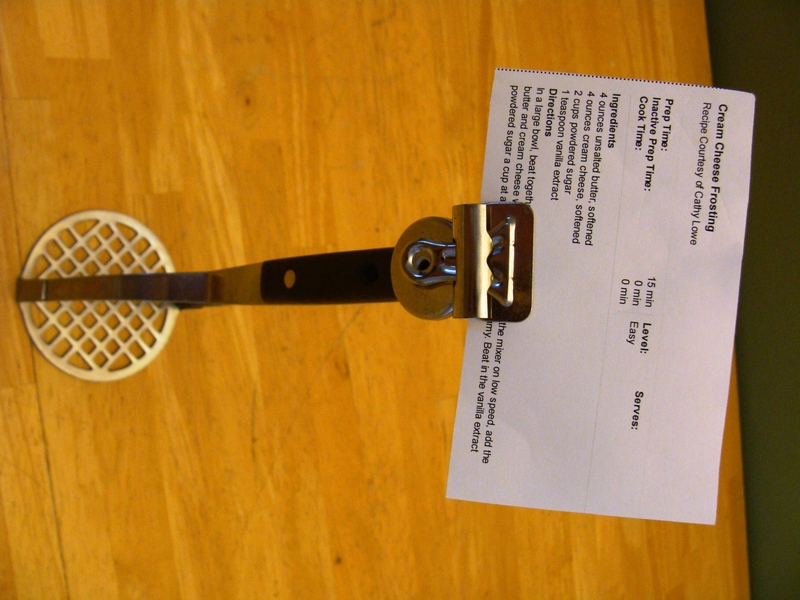 Just use a strong glue to attach a clip or clothespin to the base of the utensil so it can hold a recipe card straight up. Feel free to decorate or paint the utensil in the colors of your kitchen or even use an appliance epoxy spray to add color to any metal parts. Just remember that you can’t use it for food after it’s been spray painted! 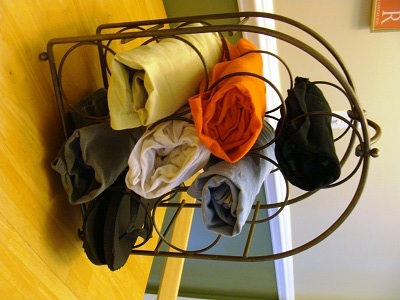 Old wine racks can be used for a number of things, but one of the best uses I’ve found is to use them for holding cloth placemats near the dining room table. They can also be used, as pictured above, to hold random swatches of cloth for craft projects or spare t-shirts and flip flops for easy access. 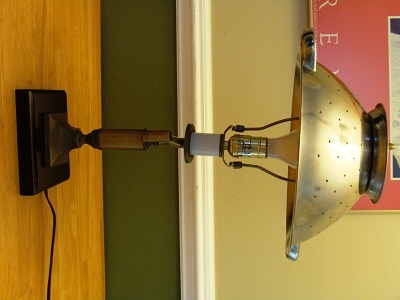 What are some ways you’ve found to repurpose old kitchen items? Have you discovered other ways in which to de-clutter your kitchen? Working with storage units users all over the United States, Tim Eyre helps customers store their stuff in places like the Denver storage units facility. Tim also contributes to the conversation at blog.extraspace.com. Categories: Interior Design & Decorating, Organization | Tags: colander lampshade, kitchen clutter, kitchen organization, organizing tips, re-purpose, recipe holder, spoon rings, towel holder, wine rack | Permalink.